A tired dog is a good dog. 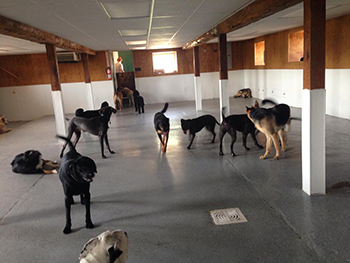 Playing all day at Ridgewood Canine Camp ensures that your dog will be rested and ready to cuddle on the couch with you after a long day at work. Our facility offers over 3500 square feet of climate controlled indoor play space. We also have an acre of land divided into four outdoor fenced play yards. 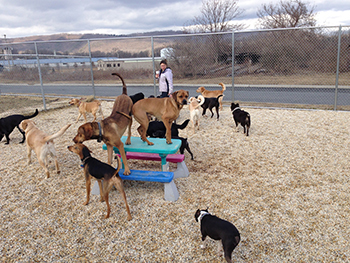 Dogs with us for daycare spend time indoors and outdoors, weather pending. We have shade tarps, kiddie pools, and sprinklers for entertaining fun. We do use kennels for naptimes and timeouts throughout the day. *Package does not need to be used consecutively and cannot be used in conjunction with overnight boarding. Days do not expire. Dogs may be dropped off and picked up anytime during our business hours. Dogs picked up after 6:30pm will be subject to late fees. We do not offer daycare on Saturdays or Sundays. We do not offer daycare on the following holidays: Memorial Day, July 4th, Labor Day, Thanksgiving Day, Christmas Day, and New Year’s Day. REQUIRED. We have a limit to how many dogs we take per day and we do fill up. Please call or email to set up a reservation. We offer daycare as needed, or we can set up a recurring schedule. If you need to cancel, please give us 24 hours notice. Required for new dogs. All dogs must be spayed/neutered (if over 6 months) and up to date on the following vaccines: Rabies, Distemper, and Bordetella. Temperament Tests are done by appointment and takes about an hour. The test is free and done without owners present. Please call to schedule your dog’s Temperament Test.